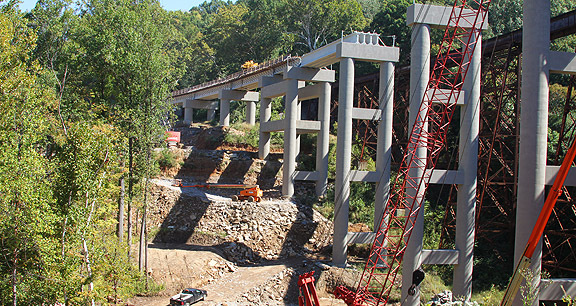 Project obstacles and solutions: P & L Railroad needed to replace two old iron bridges in West Point, KY. The old structures were over 100 years old and had deteriorated with rust to the point they were unsafe for train traffic. The bridges spanned a valley between two mountains 130 feet off the ground. They are in a remote area that had limited roads. Haydon Bridge received the contract for both bridges. Hayes Drilling drilled a series of shafts and piers along side a small mountain and creek bottom. Accessing these areas took teamwork. IMI drivers were able to access a portion of the drilled shafts directly by driving up a large hill. More remote shafts were poured with a concrete pump. Others were poured with a crane and bucket. Once the piers were complete, Haydon Bridge began constructing the columns and walls to support the bridge deck high overhead. The deck was poured in sections with a crane and bucket and concrete pump. Once the deck was completed, the sidewalls were constructed. IMI drivers had to drive their mixer trucks out onto the bridge to pour the walls of the deck. Normally this is an easy task for an experienced driver. Backing a mixer truck while pouring concrete becomes exponentially more difficult when you are 130 feet in the air. Making sure that the pour happened safely was of utmost importance. IMI personnel accompanied each truck onto the deck to give backing instructions to the drivers. With careful planning and attention to safety the sidewalls were poured without any incidents. All in all IMI has placed over 15,000 yards of concrete in both bridges.